I just love zentangle… and using these bird stamps is genius! Great share! A good dose of Normal is good. American Red Cross is always in need as they reach out to many. Thanks for doing what you’re doing. May you be richly blessed! Thanks for not giving in to the absurdities in this world, and giving us peace and beauty. Make a wish foundation is my choice too. 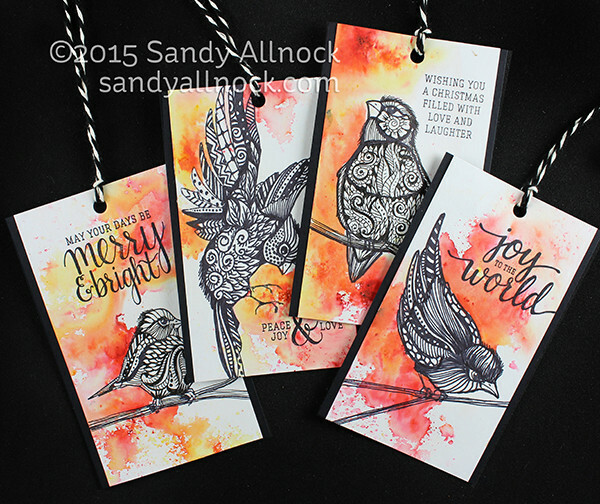 Love these tags and how the Zentangle bird really pops out from the Brusho backgrounds. My favorite charity is the National Down Syndrome Society. I would like to receive those tag on my gift this xmas… Wow your zentangeling…is awesome like everything you share ..
Love these tags. They are different and unique. Thank you for sharing your ideas, talent and creations. You are an inspiration! Love love the tags. I don’t have a favorite charity, but I do a donation to this site yearly, http://www.ratzlaf.com/main.sc/ who uses the funds for this site here: http://www.lifeassuranceministries.org/index.html Life Assurance Ministries. They do have 301k status All the subscriptions to the magazines are free to those who ask for it. Make A Wish Foundation is my choice! Awesome. Thanks for the tags and the chance to win one of these works of art. I love these tags! It was refreshing seeing you zentangle. Angels Among Us Pet Rescue is my Charity of Choice. Sandy your entire tag series just blew me away! Thank you for sharing your beautiful work. Love birds, zentangle, brusho, and all your tags this year. My charity is Randolph ASPCA. Especially at this time of year I think of how we, as humans, have the chance every day to change the world. Yet the pounds are full of unwanted animals and everyday on the new is a fresh story on someone’s cruelty to a helpless animal. We need to think that if people can be that cruel to an animal they can be that cruel to a human being also. Paris is a prime example of that. So much hate raining down on innocent people but, thank God, so many more acts of kindness and caring for fellow humans. My prayer is for God to soothe our troubled hearts and for us to do what we can to spread kindness wherever and whenever we can. I’ve really enjoyed seeing all of your set of tags but I have to tell you that these are my favorites! These are the tags I’d like to win, hint, hint! Hoping to see my name in the Winner, Winner, Chicken Dinner post! I’m not a doodler but I would love to try this! It does indeed look relaxing! It was mesmerizing to watch you zentangle! TFS! P.S . My favorite charity is the local SPCA! Enjoy your day! Your tags are always fun! I love watching your creative process. My charity is Operation Christmas Child. Amazing… Thanks for the inspiration. I’ve really enjoyed this series and love that you show us variations for each. But I have to say that your zentangle birds were my absolute favourite of all the videos in this series. They were awesome, and I love that you added colour around them rather than on them. My charity would be wounded warriors. Thanks for the opportunity to win one of these incredible tags. Thank you for such a thoughtful giveaway. I would choose Simmaron Research as my charity. They are working on medical research and public awareness for the most debilitating chronic illness CFS/ME. The disease is shockingly common and severely disruptive and yet completely ignored by the CDC and NIH. I believe it needs our help more than any other illness since they all get research funding from the government. I think your friend is quite right. A little normal goes along way during dark days. There isn’t much the average person can do but feel saddened, angry, worried. We’re pretty powerless in the aftermath of such a tragedy so a post like this, a bit of creativity, is welcome so thank you very much for posting it. My fave charity Is Women for Women International, focused on rebuilding lives and working for peace and stability. The very opposite of the hatefulness that is terrorism. Two of my favorite things! Zen tangle and cards, you can’t go wrong.mthanks Sandy, truly enjoyed all of these. Wow! Amazing tags! Zentangle looks good on you 🙂 Mission Arlington is my charity! Great tags the orange makes the birds stand out. My favorite charity is transverse myelitis. Thanks for the relief from the heart-breaking news on TV right now. Love your zentangle birds; have to check out the video next. Want to go with the Wounded Warriors for my charity today. I love all your tags, this was the first time I’VE heard of zentangle, and its amazing!!! Love all the tags you made n your generosity. Sandy, what an awesome series of tag tutorials, they are all on my to do list for this year. My charity is Alzheimer society. Your art work is inspiring, thank you for sharing. In America Clearwater Marine Aquarium (though I do not know if it is a charity) and her in Australia Riding for the disabled. Bless. Love your tags. My favorite charity is Grace Diner. Each Monday we feed 100 homeless or low income families dinner at Grace Lutheran Church here in Culver City. Okay, you have finally convinced me I need to try this! I recently bought a coloring book (your influence again!) and there are some designs in there I think will work for a beginner. LOVED the splash of color with the black and white. My charity choice is Homeless in Seattle. Thanks! 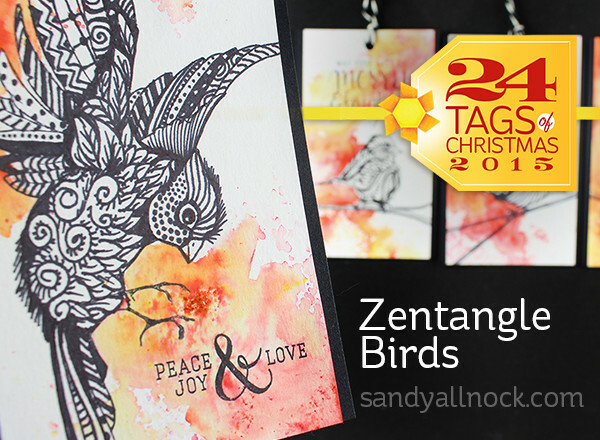 Your Zentangle bird tags are so striking! Love them. My charity is Yakima Union Gospel Mission. Thank you for the opportunity to win and spread some joy. I love your Zentangle birds! I have always wanted to try this, after watching how you did it, I am going to try Zentangle. My charity today is for ALS as I lost my best friend from high School last month to this. I love the Zentangle Birds! they are so…beautiful. Absolutely stunning!! You are a wonderful artist. Love these birds. Thank you, incredible. St. Judes Childrens Hospital. I loved the whole tag series!! You do good work Miss Sandy!! My charity if I should win is Love A Child!! Beautiful tags and lovely stamps set. I lost two friends to leukemia and lymphoma, today I will mention the leukemia/lymphoma society.